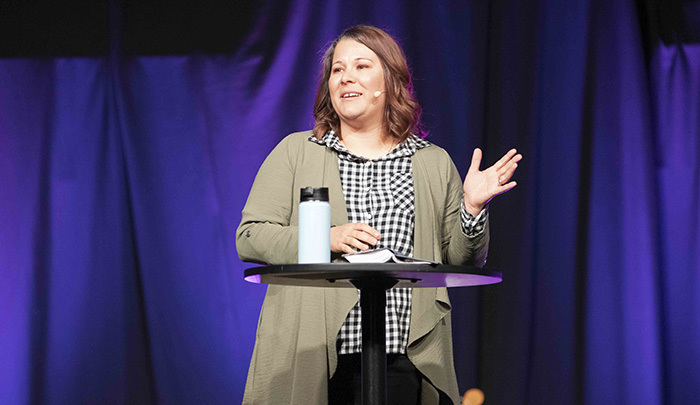 Danielle Rinnier shared an interesting observation about Grand Canyon University at the start of her Chapel talk Monday morning. Her perspective is particularly valuable – she graduated from GCU in 2007 and has worked full time at the University for nearly 10 years. It got even more interesting when she expanded on it later in the day. Sitting in her corner office on the first floor of the Spiritual Life Building, Rinnier observed that as the buildings and the student population and the programs on campus have risen dramatically in recent years, so too has the spirituality she witnesses. One place she sees it all the time is the Spiritual Life office. “Anytime a student wanders in here who’s not a regular, they’re welcoming, want to know their story, want to get them plugged in to healthy community,” she said. “On campus, people can really feel a difference, and that’s because, from my perspective, I think that God has rewired people’s hearts to really think about the fact that every person they interact with is made in God’s image, every person is valuable, every person is worthy of love. And we know that in all things God works for the good of those who love Him, who have been called according to His purpose. … Neither death nor life, neither angels nor demons, neither the present nor the future, nor any powers, neither height nor depth, nor anything else in all creation, will be able to separate us from the love of God that is in Christ Jesus our Lord. That’s true, she added, even when we sin and then hide from Him in shame. Just as Maddox did recently. Rinnier told a funny story of how her 4-year-old was sent to the director’s office at his preschool because he’s a bit of a busybody. The director was called away for a couple of minutes, so Maddox did what a lot of 4-year-olds might do in that situation – he helped himself to the candy jar on the desk. One problem: He left the evidence, in the form of candy wrappers and half-eaten chocolate, on the floor, where he was hiding. Nevertheless, Maddox’s first instinct was to hide – the same thing we do to God when we get caught up in today’s culture. Paul addressed that very idea in his various letters in the Bible. 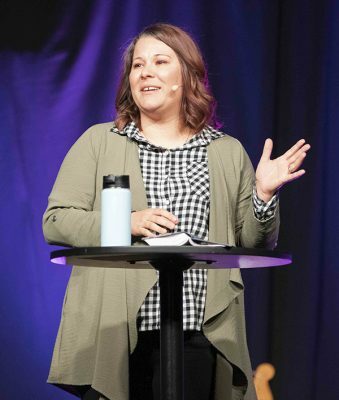 ● Next Monday’s speaker: Jodi Hickerson, Mission Church, Ventura, Calif.